Toruń is an exceptional city possesing a special charm. For almost eight centuries of its existence it has experienced moments of particular prominence, witnessed important, crucial historic moments, and first of all it has preserved what's the most essential: its cultural heritage as well as material and spiritual legacy. Toruń’s si gnificance for general history can be considered not only in terms of its membership in the Hanseatic League and the participation in the Thirteen Year’s War. The very foundation of the city in 1233 under ‘the Law of Chełmno’ (the German law) fundamentally impacted both the general history and the history of the Pomeranian region, Poland and the whole of Central and Eastern Europe. Established as the consequence of German colonization in Poland, Toruń became the first municipality to achieve self-governing status and had a largely formative role in the development of burgher class identity. The foundation of Toruń and Chełmno in 1233 fostered the formation of a new and innovative model of the city, following the Western pattern and differing from the rural area in legal and economic sense. From 1459 onwards, Toruń City Council held the judiciary power, effective in all cities established under the Law of Chełmno. Toruń joined the Hanseatic League – the most important medieval trade association – as early as a few dozen years after its foundation, i.e. in 1280. Thus, it early adopted the European economic models and became an important part of European economy, with several Toruń burger s becoming senior members of the Hanseatic office in Bruges. The Old City of Toruń as the oldest members had the power to summon the meetings of all Hanseatic cities within the Prussian Quarter and could boast the most senior representatives, while Toruń City Hall housed the archives of the Prussian Quarter. Toruń burghers, most of whom were German speakers, hugely contributed to the fall of the Teutonic State and turned to the King of Poland to include the city into the Kingom of Poland. They played an enormous role in the formation of the Prussian League, offering Poland a significant financial backing in the Thirteen Year’s War against the Teutonic State. Their military intervention insisted not only in destroying the Teutonic Castle, but also in conquering the castles of Brodnica and Świecie. As a consequence, the Second Peace Treaty of Toruń in 1466 put an end to the former Teutonic State, while its most precious lands formed an autonomous province known as Royal Prussia within the Kingdom of Poland. 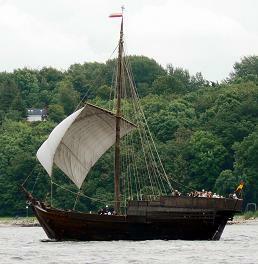 Cog was a medieval ship used in the Baltic and North seas. It is a maritime tradition of Toruń and a symbol of belonging to the Hanseatic League. It mainly cruised on rivers and seas, using the coastal shipping. Cog was the most common means of water transport in Toruń, and all European cities trading with each other within the Hanseatic League. The vessel played an important role in European trade, especially from the 12th to the 14th century. The complaint of the seniors of Hanza counting-house in Bruges for fur forgery by Toruń furrier Peter Rhode, Bruges 16th Feb 1446. It is probably the only unique letter with an 'enclosure' of that kind preserved in Europe from Middle Ages, the proof of forgery is a piece of squirrel leather made as sable fur. Located at the intersection of European routes, Toruń has always been aspiring to greatness not only due to its political and economic position. In its rich history, frequently filled with dramatic events, it became an outstanding example and symbol of the European cultural heritage. Its material and spiritual legacy was preserved not only in the highest class architecture but also in the form of live and continuously enriched art as well as its residents way of living. Toruń gained its welfare and beauty not loosing but preserving its cultural identity. All of that contributed to the fact that in 1997 Toruń entered the UNESCO's List of the World Cultural Heritage as a site of universal value, constituting a centre of culture and exchange of humanist thought. Traveling by the Toruń trials of the World Heritage we admire beautiful and colorful city. Within the area of the medieval Old Quarter there are numerous monument that literally remember the 13th-century origins of the city, since a significant percentage of medieval architecture has been preserved.